"Run for your life!!!........ 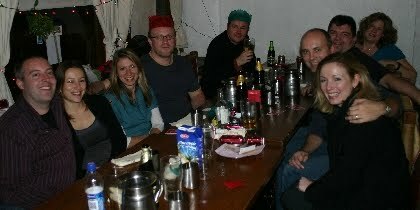 (you chicken)..."
Plenty of curry, several bottles of beer, a few party hats and some strange little aniseed seeds all combined to help produce a great night out for the IBG’ers at their inaugural Christmas ‘do’. But undoubtedly, the cherry on the cake was the appearance of the IBG WAGs – 4 stunning ladies who deserve a collective medal for putting up with such a strange bunch of boardgame blokes. Thanks to everyone who turned up and helped make it such a fun evening – roll on the summer 2010 IBG BBQ!